Spice up life with a bag of these chili mango jelly beans. 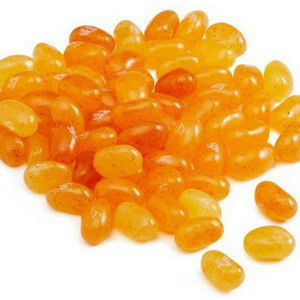 Each jelly bean is infused with sweet mango flavor and specks of chili powder making this candy a great spicy/sweet treat. Sugar, corn syrup, modified food starch, less than 2% of: mango juice concentrate, citric acid, paprika, cayenne pepper, natural & artificial flavor, artificial color yellow #6, beeswax, caranuba wax, confectioner's glaze, and salt.